It’s official! The Peirce Information Technology Student Association (ITSA) has been formally recognized as a student chapter of the Association for Computing Machinery (ACM). We were chartered on Jan. 13, 2011. ACM, the world’s largest educational and scientific computing society, delivers resources that advance computing as a science and a profession. Being a part of this premier national organization is exciting news for our Information Technology program as we strive to provide the best education and resources to students pursuing an IT degree at Peirce. The ACM is the oldest and most respected organization of its kind in the IT industry. 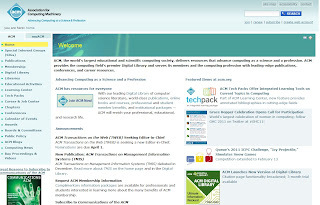 It serves its members and the computing profession with an abundance of resources intended to enrich the professional, educational, and research lives of its members and the computing profession. Among its many professional and student member benefits, ACM provides the computing field's premier Digital Library of computer science literature, offering access to leading-edge publications and online books and courses. ACM membership gives the Peirce IT program connections to the wider world, which is very important and confers many benefits to our students. Having a student chapter of the ACM opens up opportunities for Peirce students to access mentoring programs, conferences, competitions in areas such as programming and security, scholarships, and career resources, just to name a few. These are just some of the significant benefits that will be available to Peirce students who take advantage of this opportunity to become a member of the ACM. Many of you are already members of the ITSA, and I encourage you to officially join the ACM as well! To become a student member, sign up via the ACM Quick Join Student Application Form, and attend one of our upcoming meetings to get acquainted with the organization. Meetings are currently scheduled for Feb. 10 (today! ), March 24, April 14, and May 19. If you have any questions about joining or would like more details about the meetings, send us an email. We always talk about the importance of continuing your education, whether that means pursuing a new degree or taking advantage of training resources and certification programs -- ACM membership offers new avenues for Peirce students to further their professional development. While we are still in the early stages of our ACM charter, down the road we’ll be eligible to become part of the Upsilon Pi Epsilon International Honor Society for the Computing and Information Disciplines, which is something we are eager to pursue. We’ll keep you posted on further developments and new opportunities as they emerge. In the meantime, we welcome your questions, so leave a comment below or give me a call at 888.GO.PEIRCE, ext. 9308.